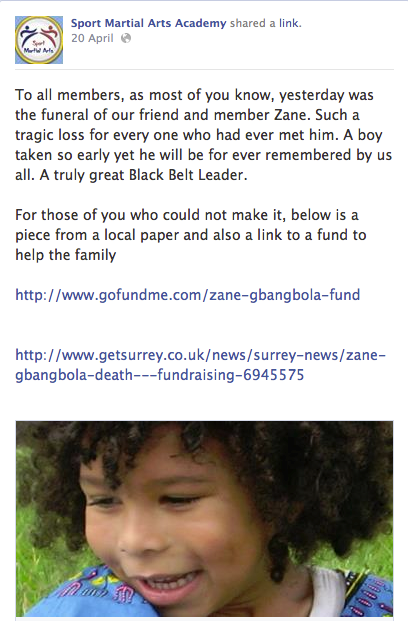 Zane Gbangbola has been described in tributes as a truly wonderful boy. Zane was our reason to exist say his parents, he was a kind, loving, intelligent, funny child with a beautiful smile. THE 'LIVELY AND HAPPY' seven -year-old boy Zane Gbangbola, who died tragically on Saturday 8 February brightened the lives of those who met him, said his parish priest the Revd Laurence Gamlen. A book of condolence has been opened at Holy Trinity Church, Lyne, which Zane regularly attended with his parents Nicole and Kye. 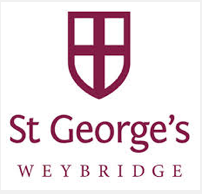 Laurence said: "The congregation of Holy Trinity is joining with a family, St George's Junior school, Weybridge, and the whole of Chertsey, Lyne and Longcross as we mourn the death of Zane Gbangbola. “We are a community in shock at a young life which has ended abruptly. "Zane, as well as his mother and father are well known and much loved members of our church family and congregation. We knew Zane to be a lively, happy child who brightened up the lives of all who met him. “We will miss his sense of fun and in particular the way in which he enjoyed playing with the younger children in our church family." Prayers said for family as condolence book opened Prayers were said in church on Sunday morning for Zane, and for his parents who remain in St Peter's Hospital, Chertsey, and Holy Trinity church is open for anyone who feels the need for a quiet space, or time for reflection and prayer. “As Christians, we believe in the power of God's presence to comfort those who mourn, and we pray for His presence to be made very real to Kye and Nicole; with Zane's school friends and wider network of friends and family, as they begin to come to terms with their loss,” said Laurence. “Our thoughts and prayers are also with all those who are investigating this tragic situation." The cause of Zane's death is not yet known. Zane was a ‘larger than life’ character who was known throughout the Junior School; in fact, he was probably the best known pupil from the Lower Years amongst the Upper Years’ children due not only to his lovely ‘shock of curls’ which made him visibly stand out, but far more importantly because he was a passionate member of the Green Committee – a cause he had clearly inherited from his parents. Zane was only at the Junior School for a year and a half, but what a privilege for us all that what turned out to be the final chapter of his life was spent amongst us here at St George’s in Years 1 & 2. And it’s been lovely for me personally this Academic Year, as his Headmaster, to have had the opportunity to spend a couple of hours or so with him each week, teaching him RE and taking him for Football Club. Just before Christmas, we were discussing as a class in RE what Heaven might be like, and Zane had so many questions he wanted answered! It’s extraordinary to think that he now knows all the answers! Zane was very much at ease talking with adults, and he’s certainly one of those characters whose voice I can vividly hear in my head! Only the other day, he asked me if it was ok to wear his studs for Football Club because he didn’t want to slip over on the wet grass; the children normally wear trainers, but he asked so nicely, how could I say ‘no’?! And now he’s slipped away to his home in heaven – his home and our home! He is at peace now; as always, it’s those who are left behind who can feel left in darkness when a much loved one – especially one so young - dies so suddenly. It’s always the good ones who seem to go first, isn’t it? Well, there are no easy answers or solutions, but what we do know is that Zane and his wonderful parents would want us to see this as an opportunity to grow closer together as a community, and to help us to put a lot of our everyday worries into perspective. To appreciate that life is a gift from God and that is very good; we must rejoice in it and appreciate it as gift every moment of every day! We’re going to show our appreciation of the gift of Zane’s life over the coming days by trying to recall our favourite memory of him and compile a memory book of him which we will present to his parents as a precious gift from us all. Let us reflect over the coming days, as well, on the gift of Zane’s short life with us – above all his love for life - which he is now living in Heaven to the fullest! May he rest in peace. Amen. Many of you will know that I live right in the middle of the Thames Severe Flood area, in Staines. Over the last 10 days we have been planning, protecting and praying as water levels rose and rose and the rain kept coming. My facebook page has been inundated with my friends’ tales of woe – people stranded, people being evacuated, power, gas and water cut off, and portaloos in the street for all their neighbours to share. I have helped out where I can but it has been extremely stressful for all of us. Thankfully so far the flood has not affected my family or my house personally, although at times it has felt like I am just holding the river waters back with the strength of my will alone. I haven’t really paid attention to the media – frankly there is enough bad news coming from my own friends, for me to need or want to know what is happening to other people, even in neighbouring towns. Is that selfishness? Maybe it is, but also realistic. At times like these you do have to look after your own. But then came the punch in the face. An innocent text from a neighbour “Is your son OK – we saw that the poor boy from his martial arts class passed away”. I had vaguely heard about the boy from Chertsey that had died – I skim read the story on the front page of a newspaper I don’t buy. I may have noticed the name but it didn’t register with me – I don’t know anyone from Chertsey…. But after this text I had to check things out and the reality hit me. Yes we did know Zane and his family quite well – he was one of the absolute little characters of my son’s martial arts class. I had to tell my children of the tragedy and we are all reeling from it. I am very thankful that I have not had to feel the grief of losing a child. But like many bloggers I have witnessed the grief of child loss unfurling through members of our community – I can only imagine how devastating it must feel. 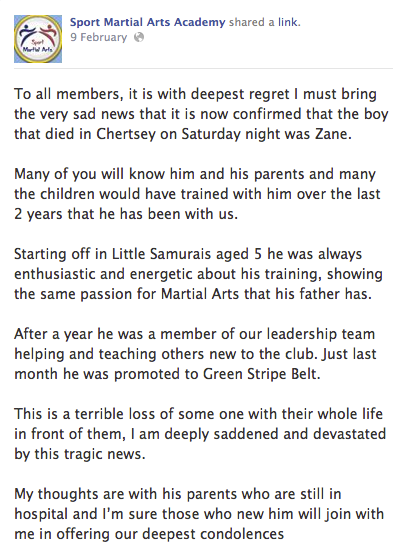 And this feels devastating to my and to my children - never mind what it must be like to Zane’s close friends and family. What can you do at times like these? Send love, hugs, thoughts, prayers and good wishes? I know it won’t help at all. I am not sufficient of a friend to Zane’s parents that my physical presence would be a comfort – they are acquaintances really and they have enough to deal with wihout me showing up. But that doesn’t stop mine and my children’s hearts breaking with my own grief, and in empathy at the great loss that Zane’s parents have suffered so suddenly and in such tragic circumstances. I really want to reach out to Kye and Nicole, give them a big hug and let them know that we are thinking and praying for them. There really isn’t very much else I can do. But of course, here is the tragedy – our paths will probably never cross again, as they no longer have a reason to come to the martial arts club where I used to meet them. Even just thinking that breaks my heart for their loss. So I can only do what bloggers do at times like these, express my feelings online, and maybe if they Google their son’s name at some point in the future, when they are able to face it, they will know that people out there really cared for Zane. Zane was a complete character – small in size but huge in personality. He was cheeky, happy and always tried his hardest. He was one of the youngest boys in the Leadership class, but he was a real fighter, and certainly embodied the tenets that the school tries to teach its students: Courtesy, Integrity, Perseverance, Self Control and Indomitable Spirit. When my son Eoin, two years older, was struggling with a taekwondo move, Zane was there, holding pads for him and helping him train. He just wanted to help and give support to others at all times – his bubbly spirit was really infectious. His mum is lovely too – also giving Eoin a bit of a pep talk when he was struggling and helping him finally to overcome the obstacle he was up against. I have a great memory of Zane just two weeks ago, grinning from ear to ear as he received his green stripe belt – which meant that he was finally allowed to move up into the next level class. Zane will be very much missed in that class – it just won’t be the same without him. My children and I feel very happy to have known Zane, even though the time was too short. He was a credit to all his family and will be sorely missed by everyone whose lives he touched. Update April 2014 – A fund has been set up to help Zane’s family. Zane’s father is still unable to work and their house is still flood damaged. Please spare a few pounds to help this lovely family to rebuild their lives after this tragedy.